Appalachian Ski Mountain is OPEN - 10 slopes with 4 lifts on a base of 22 - 36 inches. Cold weather is on the way so that snowmaking can resume. Beech Mountain Ski Resort is OPEN for skiing and boarding on 8 slopes with 3 lifts on a base of 18 - 40 inches. Cataloochee Ski Area is OPEN - 10 slopes with 4 lifts on a base of 20 - 40 inches for day and night skiing. Holiday rates are in effect. Sapphire Valley Ski Area - is temporarily closed from wet weather and expected to re-open 12/23. Frozen Falls Tubing is temporarily closed and expected to re-open 12/23. Sugar Mountain Ski Resort is OPEN - 9 slopes with 4 lifts on a base of 17 - 45 inches for day and night skiing and boarding. Ice Skating is open. Tubing is open on 3 lanes. Wolf Ridge Ski Resort is OPEN - 5 slopes with 2 lifts on a base of 30 - 40 inches for day and night skiing and boarding. Tubing is open. December 20 - 22 Santa Claus will be at Beech Mountain Resort daily from 3:30 PM-5:30 PM, in the View Haus Cafeteria. All are welcome to visit with Santa. Picture packages are available starting at $15 and include a hot chocolate. December 20 - Appalachian Terrain Park will host a Fresh Friday presented by SPY Optics. Expect some new and unique features for the event, as well as fun and exciting antics from the SPY crew, who never fail to entertain. Appalachian Ski Mountain is OPEN - 9 slopes with 4 lifts on a base of 26 - 40 inches. Conditions are are great. .
Beech Mountain Ski Resort is OPEN for skiing and boarding on 8 slopes with 3 lifts on a base of 22 - 44 inches. Cataloochee Ski Area is OPEN - 11 slopes with 4 lifts on a base of 26 - 46 inches for day and night skiing. Holiday rates are in effect. Sapphire Valley Ski Area - is CLOSED. Predicted opening date 12/18. Frozen Falls Tubing had 11/29 Opening, but is temporarily closed until 12/18. Sugar Mountain Ski Resort is OPEN - 10 slopes with 4 lifts on a base of 20 - 51 inches for day and night skiing and boarding. Ice Skating is open. Tubing is open on 4 lanes. New natural snow. _Tom Terrific" is now open for skiing and riding. Wolf Ridge Ski Resort is OPEN - 4 slopes with 2 lifts on a base of 30 inches for day and night skiing and boarding. Tubing is open. Get links for all NC Ski slopes on the NC Ski Resort Guide. December 16 - Cataloochee Ski Mountain has taken advantage of the cold weather with around the clock snowmaking and is now open all the way to the top of the mountain on Upper Omigosh. Additional terrain for skiing, boarding and tubing will continue to open as quickly as the weather permits, providing for great holiday skiing and riding. Get a link for Cataloochee Ski Area and nearby ski lodging on the Maggie Valley Visitor Guide. Appalachian Ski Mountain is OPEN - 8 slopes with 4 lifts on a base of 24 - 38 inches. Snowmaking in progress. Cataloochee Ski Area is OPEN - 10 slopes with 3 lifts on a base of 23 - 43 inches for day skiing until 4:30. Night skiing begins 12/17. Sugar Mountain Ski Resort is OPEN - 9 slopes with 4 lifts on a base of 17 - 49 inches for day and night skiing and boarding. Ice Skating is open. Tubing is open on 4 lanes. New natural snow and snowmaking in progress. Wolf Ridge Ski Resort is OPEN - 4 slopes with 2 lifts on a base of 30 inches for day skiing and boarding. Tubing is open. Get links for all the NC Ski Resorts, Areas and Tube Parks on the NC Ski Resort Guide. December 12, 2013 BEECH MOUNTAIN, N.C. - A kid-favorite winter attraction in the North Carolina mountains has opened for the 2013-14 season. 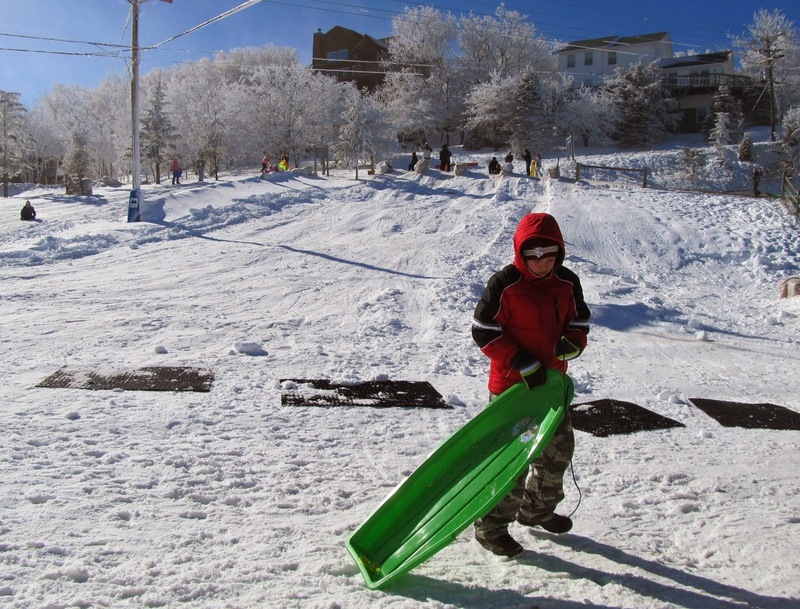 Beech Mountain's youth sledding hill offers a wonderland of fun daily for children 12 and under. Located next to the town's visitors center, the hill provides good sledding conditions with a combination of natural and man-made snow. The free sled run is operated by Beech Mountain Parks and Recreation Department seven days a week (weather permitting) with safety personnel on duty. A loud speaker plays music and hot chocolate is available at nearby restaurants. Plastic sleds are required. Families may bring their own, or sleds are available for rent or purchase at nearby stores on the mountain. Hours of operation are: 1 to 5 PM weekdays; and 9 AM to 5 PM on weekends and holidays. The sledding hill stays open through late February or early March, depending on the weather. Real-time sledding hill conditions are available by calling the visitors center toll-free at (800) 468-5506. Additional info is at: www.beechmtn.com. Appalachian Ski Mountain is OPEN - 8 slopes with 4 lifts on a base of 16 - 30 inches. Snowmaking in progress. Cataloochee Ski Area is OPEN - 6 slopes with 3 lifts on a base of 6 - 30 inches for day skiing until 4:30. Snowmaking in progress. Tibe World will be open 12.14. Sapphire Valley Ski Area - is CLOSED. Frozen Falls Tubing will re-open on Saturday, 12/14. Sugar Mountain Ski Resort is OPEN - 9 slopes with 4 lifts on a base of 12 - 40 inches for day and night skiing and boarding. Ice Skating is open. Tubing is open on 3 lanes. Snowmaking in progress. Wolf Ridge Ski Resort is OPEN - Operations are suspended for now with expectation to reopen on Friday, 12/13, weather permitting. December 14 - 15 Cataloochee Ski & Snowboard Swap This is a first-time event and a great way to get rid of your older gear and make room for the new. The Swap will be held on Saturday from 8 AM-5 PM and Sunday from 8 AM-2 PM. Registration and equipment drop off will be on Friday, from 3 PM - 7 PM and again on Saturday morning from 7 AM-8 AM. Tags and seller instructions are available by contacting catskiswap@yahoo.com. Learn more about Cataloochee Ski Area on the NC Ski Resort Guide. December 13 Smith/ Skullcandy Friday the 13th Jam at Appalachian Ski Mountain Join ASM Terrain Park and Smith Optics for a special park session. Lots of Smith goodies will be up for grabs, and the event will be sure to feature a mysterious theme and setup in honor of the date. Get a link for details about the Smith - Skullcandy Jam at ASM on the NC Ski Resort Guide. Appalachian Ski Mountain is OPEN - 9 slopes with 3 lifts on a base of 11 - 24 inches. Cooler weather predicted as the week progresses. Cataloochee Ski Area is OPEN - 7 slopes with 3 lifts on a base of 8 - 18 inches for day skiing until 4:30. There are some thin and bare spots and a loose granular surface. Sapphire Valley Ski Area - is CLOSED. Frozen Falls Tubing had 11/29 Opening, but is temporarily closed from 12/2 to 12/14. Sugar Mountain Ski Resort is OPEN - 7 slopes with 3 lifts on a base of 6 - 34 inches for day and night skiing and boarding. Ice Skating is open. Tubing is open on 2 lanes. Wolf Ridge Ski Resort is OPEN - Operations are suspended for now 12/6 with expectation to reopen soon weather permitting. December 13 at Cataloochee Ski Area the Cat Cage Rail Jam - a FREE entry Ski and Snowboard event. Registration will be at 6 PM with practice at 7 pm and the contest beginning at 7:30 PM. There will be great prizes, great FUN and great friends to enjoy. Spectators are welcome and food and beverages will be served in the lodge. The slope will be open to event participants only. The rail jam will be on main slope in front of lodge and in viewing area of the new deck. Helmets are required. Get a link for the Cat Cage Rail Jam, Cataloochee Ski Resort and all NC Slope news on the NC Ski Resort Guide. Appalachian Ski Mountain is OPEN - Operations are suspended for Friday 12/6 in anticipation of a thunderstorm both day and evening. Skiing, Riding, and Ice Skating will resume on Saturday, December 7 on a regular schedule. Saturday anniversary prices are $5.00! Beech Mountain Ski Resort is OPEN for day skiing and boarding on 8 slopes with 3 lifts on a base of 12 - 30 inches. Cataloochee Ski Area is OPEN - 8 slopes with 3 lifts on a base of 12 - 28 inches for day skiing until 4:30. There are some thin and bare spots and a loose granular surface. A return of more seasonable temperatures and snowmaking on Sunday evening is anticipated. Sugar Mountain Ski Resort is OPEN - 8 slopes with 3 lifts on a base of 8 - 38 inches for day and night skiing and boarding. Ice Skating is open. Tubing is open on 3 lanes. Wolf Ridge Ski Resort is OPEN Operations are suspended for Friday 12/6with expectation to reopen on Saturday, weather permitting. December 7 - Grand Opening of "5506" Beech Mountain's new Skybar. Beech Mountain has added a new amenity for guests - a skybar providing food and beverage service at the top of the mountain. This newly-constructed facility has been named "5,506", paying tribute to the elevation that gives Beech Mountain the title of highest ski area in eastern America. Step off the chairlift and into a cozy, glass roundhouse, where you can enjoy food, drinks and snacks in comfort. Be sure to check out the large deck, with beautiful panoramic views of the Blue Ridge Mountains. Learn more about Beech Mountain Ski Resort on the NC ski Resort Guide. December 7 Burton Riglet Park Tour at Appalachian Ski Mountain. A product demo and mini snowboard park for the little boarders. A custom children’s learning terrain area will be provided at the base of ASM and Burton Snowboard experts will be offering a free “introductory terrain park experience” for children ages 2 to 6. The idea is to get children comfortable on the snow, and moving over small changes in terrain. Registration is FREE and helmets are required or all participants. 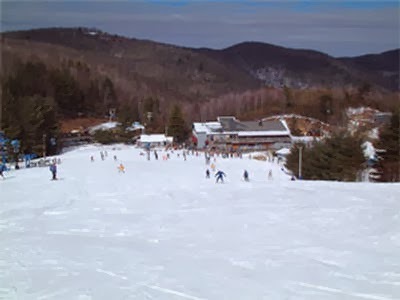 Get a link for details about the Burton Riglet Park Tour and Appalachian Ski Mountain on the NC Ski Resort Guide. December 7 - 8 Appalachian Ski Mountain Anniversary Celebration Come celebrate Appalachian's 52nd year of family fun as they roll back tickets to 1962 prices. Pay only $5 for Ski Tickets for the Day Session from 9 AM to 4 PM. Appalachian Ski Mountain is located in Blowing Rock NC. Appalachian Ski Mountain is OPEN - 9 slopes with 5 lifts on a base of 14 - 26 inches. Night skiing fro 5 - 10 PM. Ice Skating is open for regular sessions. Beech Mountain Ski Resort is OPEN for day skiing and boarding on 8 slopes with 3 lifts on a base of 14 - 32 inches. Cataloochee Ski Area is OPEN - 10 slopes with 4 lifts on a base of 32 - 50 inches for day skiing until 4:30. Sapphire Valley Ski Area - is CLOSED. Frozen Falls Tubing had 11/29 Opening, but is temporarily closed. Sugar Mountain Ski Resort is OPEN - 9 slopes with 4 lifts on a base of 14 - 50 inches for day and night skiing and boarding. Ice Skating is open. Tubing is open on 3 lanes. Wolf Ridge Ski Resort is OPEN for day skiing on 3 slopes with 2 lifts on a base of 12 - 36 inches.